Excellent source of vitamins, minerals and natural proteins to promote health. 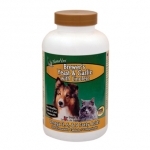 Helps control shedding while the garlic formulations are know to be a natural, superb deterrent for fleas. Available with/without garlic in tablet and powder forms. NaturVet&#39;s Brewer&#39;s Yeast and Garlic with Linoleic is a Protein-rich with essential fatty acids for healthy skin and glossy coat.